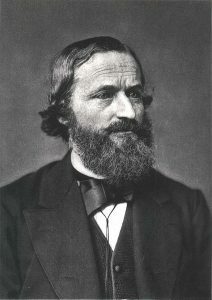 Gustav Kirchhoff (1824-1887) German physicist and spectroscopy pioneer. October 17 marks the passing of Gustov Kirchhoff. Kirchhoff was a German physicist who outlined basic rules for electrical circuits, thermal radiation, and emission spectroscopy. Kirchhoff’s work with electrical circuits spawned two rules dealing with current and potential difference or voltage. The first of Kirchhoff’s rules deals with the current at any point node in a circuit. Also known as Kirchhoff’s Junction Rule, the sum of currents flowing into a junction point in the circuit is equal to the sum of the currents flowing out of the junction point. The second rule deals with the total potential differences of a closed circuit. Kirchhoff’s Loop Rule states the sum of the electrical potential differences in a closed system is equal to zero. These rules apply to direct current circuits, but can also be applied to alternating current circuits where the frequencies of the current are very short and the wavelengths very long compared to the size of the circuits. While electrical engineers greatly appreciate Kirchhoff’s rules, his more famous work centered around the young science of emission spectroscopy. His law of thermal radiation relates the thermodynamic equilibrium of a perfect black body to its temperature and rand emissive power. He showed the limit of a body’s emission of radiation energy at equilibrium could not be greater than a perfectly black body of the same size and dimensions. This, in turn, led to his work in spectroscopy. When a gas is heated, it gives off light. When you pass this light through a prism, you will see the light is actually made up of a combination of distinct wavelengths of light. Kirchhoff formulated three laws associated with the light being emitted from objects like his black body experiment. The first law says a hot, solid object will produce light in a continuous spectrum. There will be no distinct bands in the spectra of a solid object. The second law states that a hot gas will produce light of discrete wavelengths which are unique to the gas. The third law describes the opposite effect where a hot object surrounded by a cool gas produces light in a continuous spectrum, but with distinct wavelengths missing that are unique to the surrounding gas. Since these spectral bands are unique to each element, identifying the elements in a gas is like identifying people by fingerprints. This made identifying or discovering elements a lot easier than before. Kirchhoff teamed up with Robert Bunsen to match these distinct wavelengths to known elements. While working towards this goal, the pair discovered two new elements, cesium, and rubidium. Kirchhoff’s work was a springboard for a new way of investigating elements and directly led to the discovery of many other elements. It also served as a starting point for part of the early stages of the science of quantum mechanics. 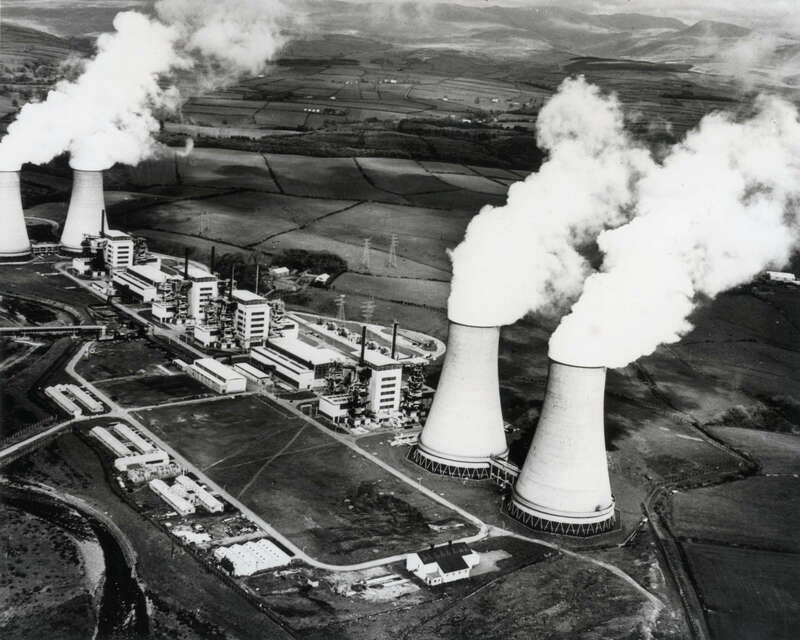 1956 – First commercial nuclear power plant officially begins operations. 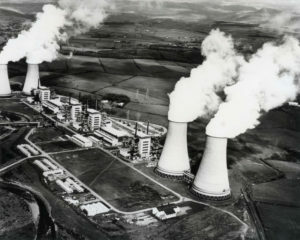 The Calder Hall nuclear power plant in Cumberland, England began operations and became the first nuclear power plant to supply commercial amounts of electricity to a public grid. Queen Elizabeth II threw the switch to divert electricity generated by the plant to the public grid in a large ceremony. The Calder Hall plant would grow to four reactors with a combined output of 200 Megawatts of power. The facility stopped operations in 2003. 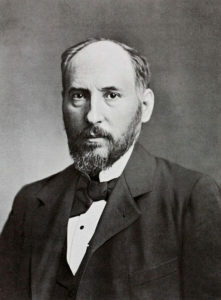 1934 – Santiago Ramón y Cajal died. Ramón y Cajal was a Spanish physician and accomplished histologist. His microscopic slide technique allowed him to highlight individual neurons. This allowed him to find the neuron was the basic functional unit of the central nervous system. This work earned him half the 1906 Nobel Prize in Medicine. 1887 – Gustav Robert Kirchhoff died. 1886 – Ernest Goodpasture was born. 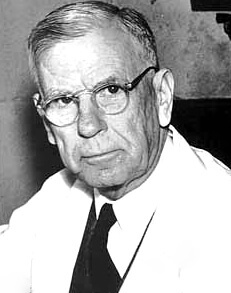 Goodpasture was an American physician and pathologist who developed a method of culturing viruses in chicken embryos and fertilized chicken eggs. Previously, viruses could only be grown in living tissues and susceptible to contamination by bacteria. With the egg method, the virus could be grown easily and inexpensively. This lead to the development of vaccines for small pox, yellow fever, typhus and chicken pox.